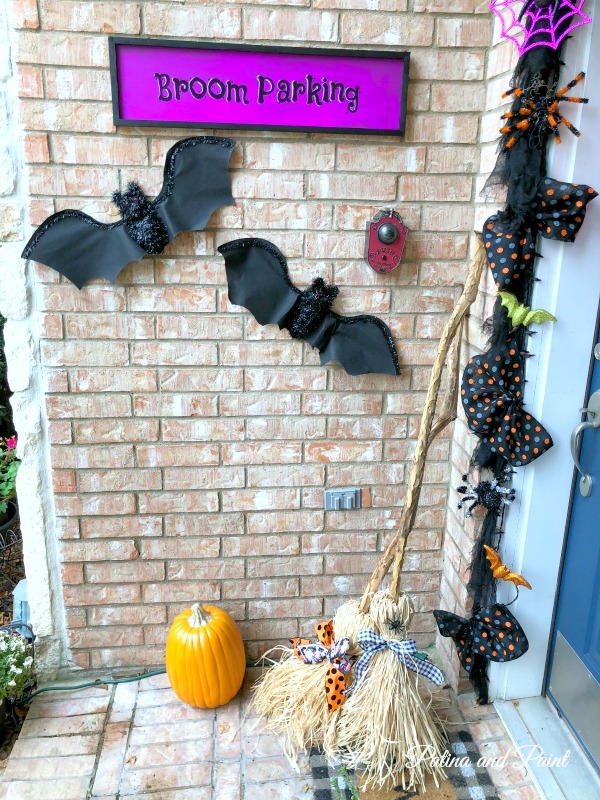 Last week I made the cutest broom parking sign. However, it’s been raining too much to even think of putting it out, until today. With a brief window of time before the next round of rain, I knew it was time to put out this sweet sign. 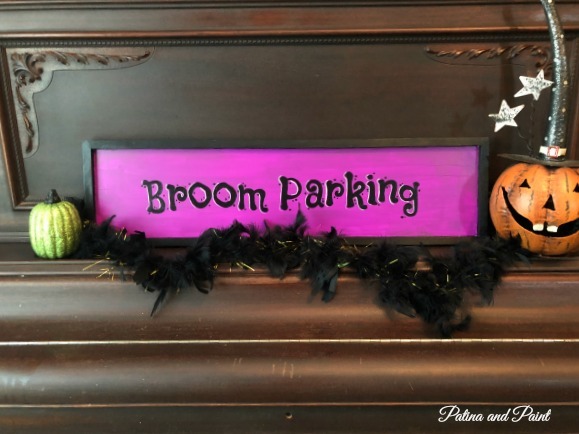 Now that the broom parking sign is hung, all that is missing are a few witch’s brooms to park! 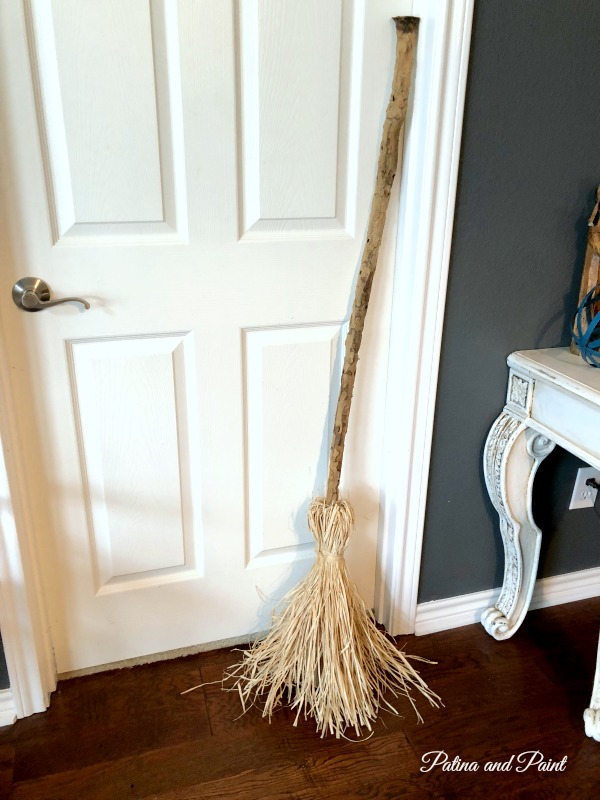 Today I’m sharing how to make a witch’s broom. 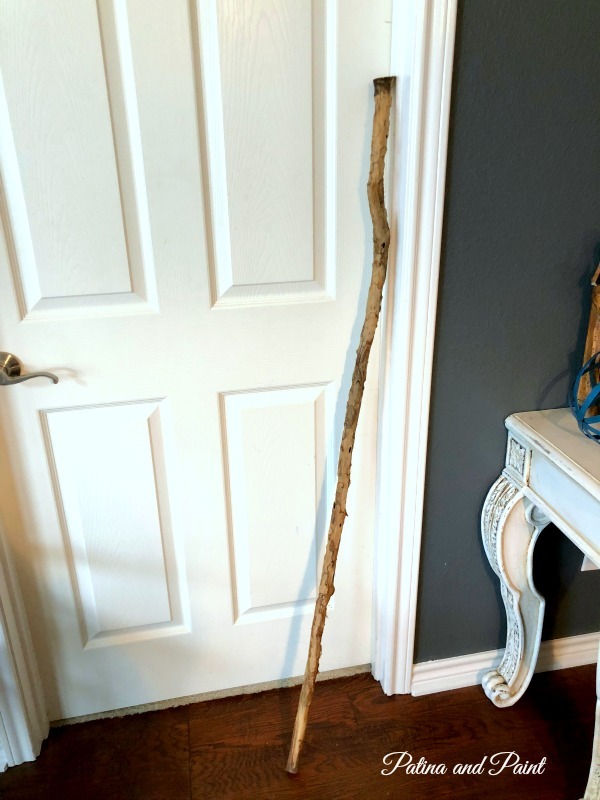 Much to my surprise, making a witch’s broom was super easy and a lot of fun! For a handle, I used a few crooked limbs from a tree we cut down earlier this year. 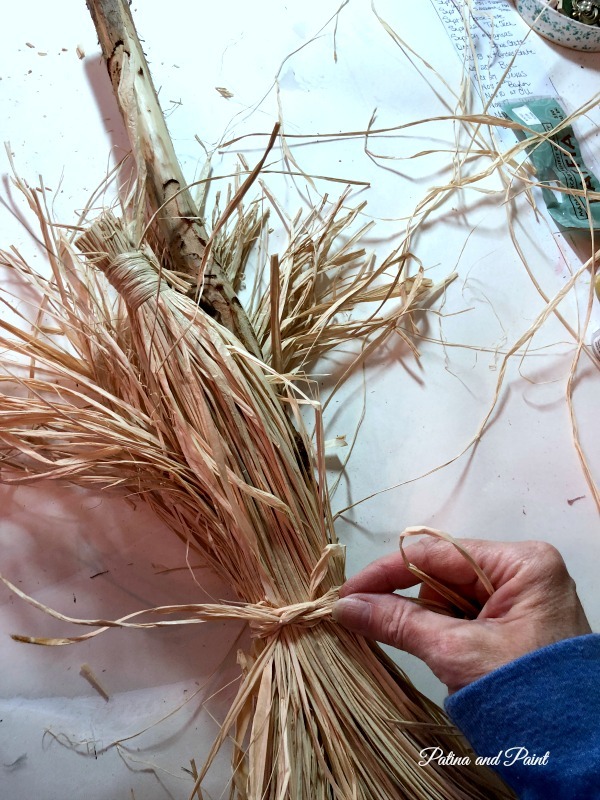 Raffia is the perfect material to make the broom’s bristles. 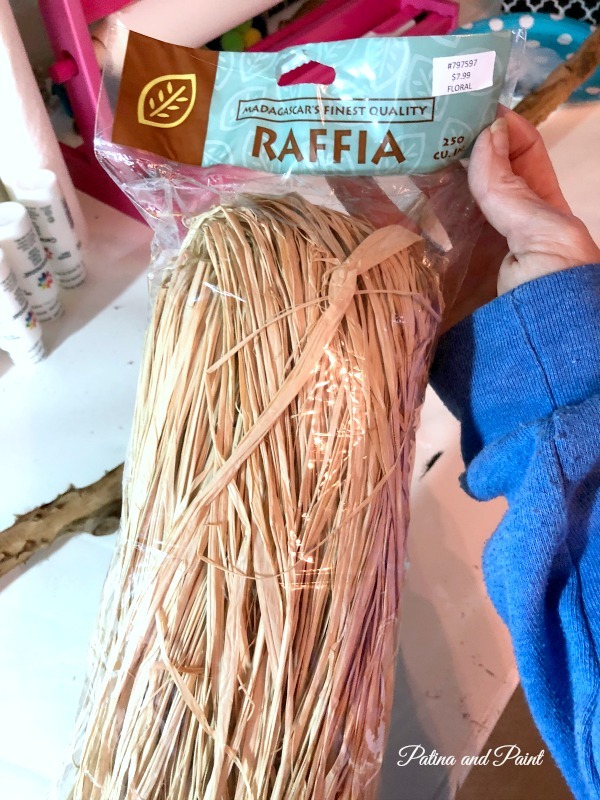 Once I took the raffia from the bag, it was super long. After cutting it in half, I determined where I wanted my boom bristles to be placed on the handle. 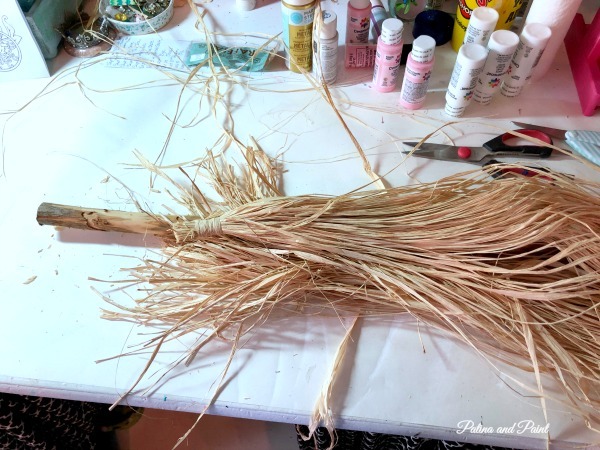 I laid down half of my raffia, the placed the broom handle on top of the raffia. 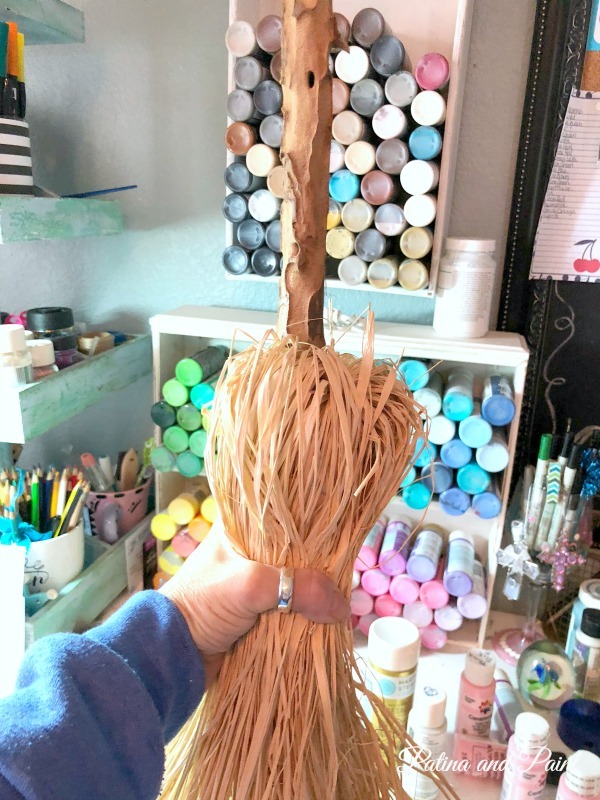 Then, I placed the remaining raffia on top of the broom handle. It’s important to place the raffia going the opposite direction that you want it to hang permanently. 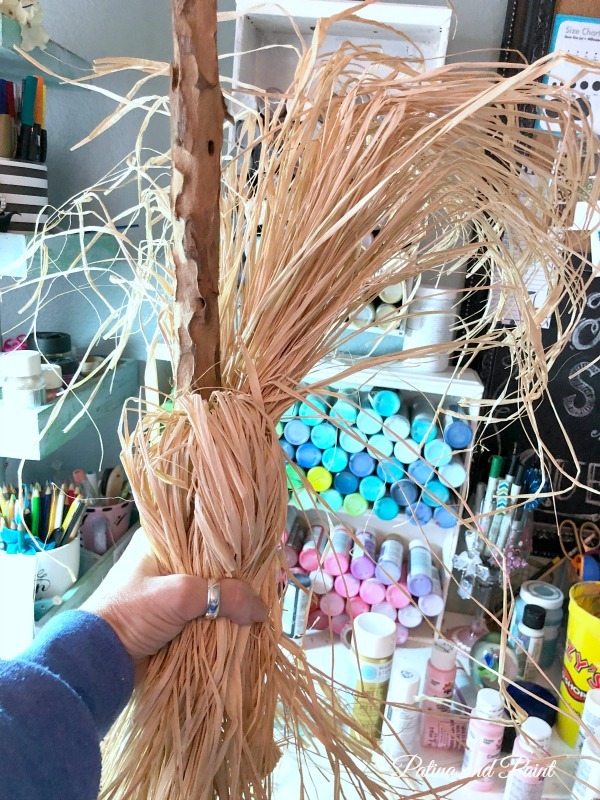 Using a couple of pieces of your raffia, tightly tie a piece around the raffia bundle about 6 inches down from the top. Next, put your “broom” right side up. 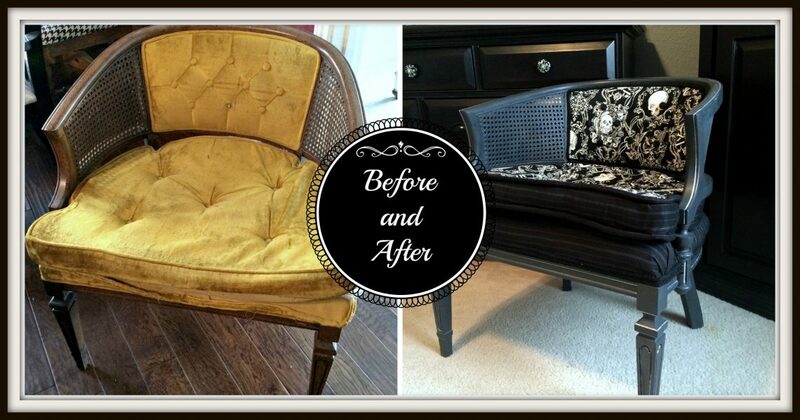 Gently, start pulling your raffia down, forming the top of your brooms bristles. The top of the bristles should look like this. 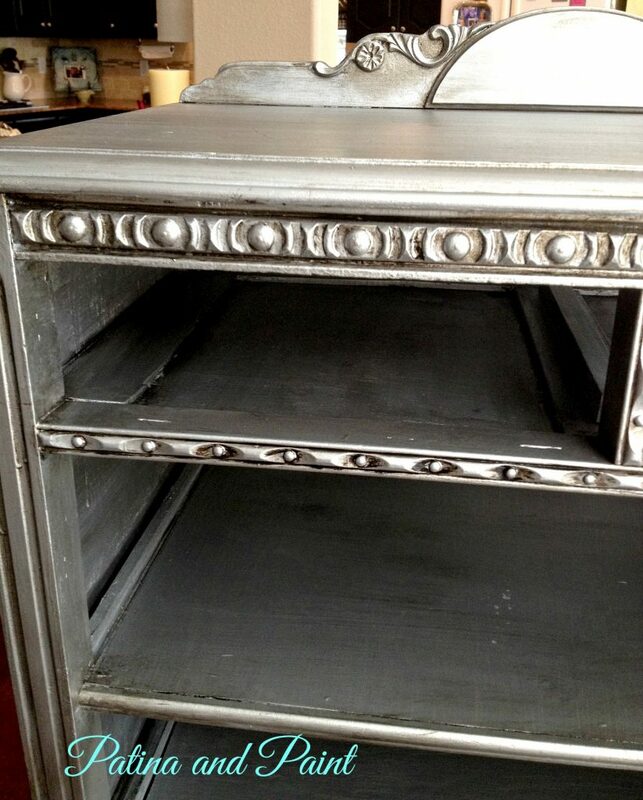 Again, using a couple of pieces of raffia, tightly tie a piece about 6 inches down from the top. The witch’s broom is done! 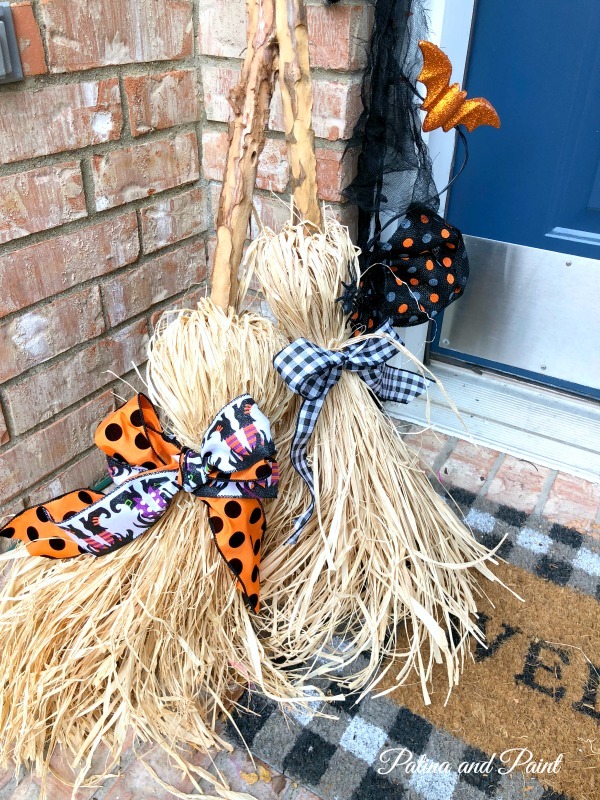 Now, I could have left it alone and called it done, but I felt like we could make these brooms much cuter! 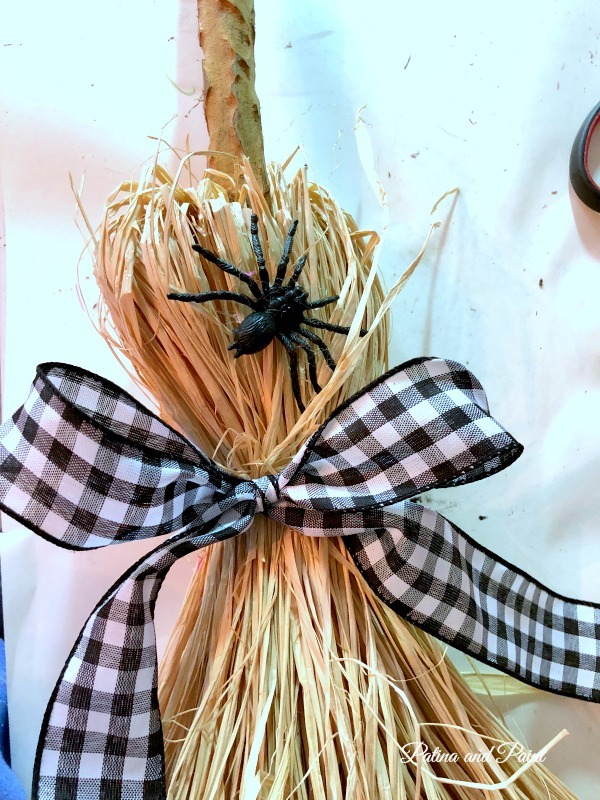 Using a few embellishments, like ribbon and spiders, I tricked this broom out! Didn’t they turn out cute? 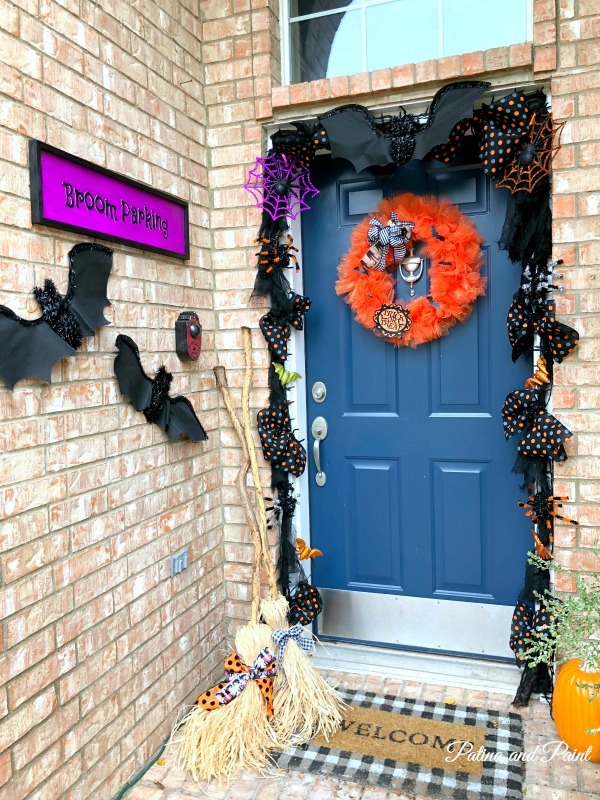 I loved the broom parking area so much, I decided to go ahead and decorate the rest of the front porch. 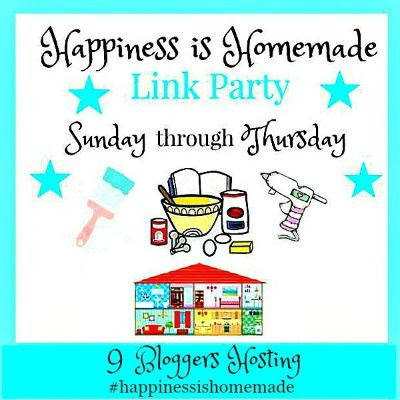 I’ll be sharing that with you soon! Oh My! You have the cutest ideas!!!!! 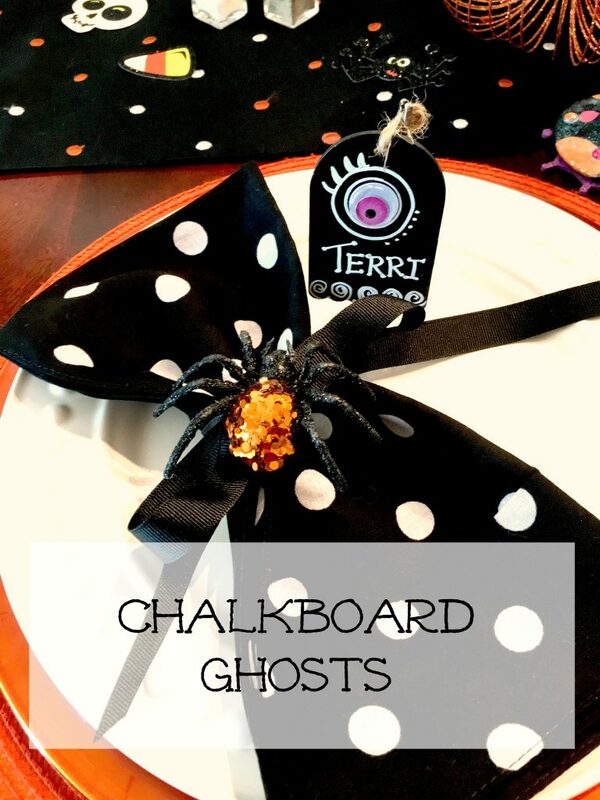 If I were to decorate for Halloween, I love your bbn ideas, Tammy. This and a splat witch would be cute together. Rita I definitely need a splat witch to complete the look for sure! Those are so cute. Love the bows and spider. 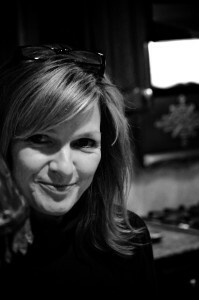 I’ll have to check my mothers and see what hers looks like… that is if she’s not riding it. Cindy, you are too funny!